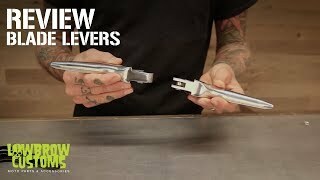 Blade Levers are inspired by the stock clutch and brake levers found on Harley-Davidson Knucklehead, Panhead and Shovelhead FLs spanning of years of 1941 through 1964. 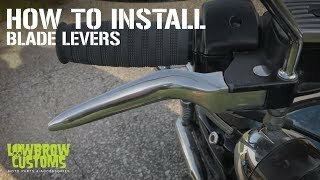 Also popular on choppers and bobbers, Lowbrow Blade Levers take the style and tradition of these classic levers to the modern day, replacing the stock brake and clutch levers on 1996 - 2003 Harley-Davidson Sportsters, 1996 and later Dynas, 1996-2014 Softails, and 1996-2007 Touring models (expect models with hydraulic clutches). Blade Levers are a quick and easy install and slim down the look of your bulky stock controls. Easy installation. Looks great. They are comfortable and are just a little shorter than stock. Excellent upgrade. The quality ypu expect from lowbrow. Will this fit my 2017 Dyna FXDB ?